Soft and comfortable and we love it. Lounge in style with the Brooklyn Loom 100% Natural Linen Duvet Cover Set. Linen is the natural moisture wicking fiber. These fibers are tube shaped which moves moisture away from your body so you stay dry. These duvet sets cover your synthetic or natural filled comforter purchased separately and provide a machine washable and natural fiber cover. The shams included in the set feature a fold enclosure. The items come in a variety of colors to match your casual lifestyle. Queen Includes: one full/queen duvet 90x92 inches and two standard shams 20x26 inches. King Includes: one king duvet 104x92 inches and two king shams 20x36 inches. Duvet and shams are made from 100% linen cloth for comfort. This item is machine washable, but please be sure to use appropriate sized machinery to avoid any excess wear on the items. This item is imported from China. I purchased the graphite linen king duvet for a queen sized bed with a deep mattress. A queen duvet did not cover the last 4 inches of the mattress so was looking forward to a duvet that would look more finished. The Brooklyn Loom Duvet Set did the trick and the linen has a lovely texture. The graphite is a nice dark gray but not a deep charcoal. I am really happy with the quality and the price. This is a nice duvet set. The color was perfect and the linen material was nice but the king size was way too short for my bed. It measures 104 and I need Atleast 110. Have to return unfortunately. If you have a queen bed I would order a king size and it will be perfect. Wished it had worked for me. Beautiful duvet set! My only complaint is that there aren’t any ties on the interior, to attach the comforter. We have both the white and blush sets, and they both look great in person. I love love love this duvet set. The linen is pretty comparable to Pottery Barns Flax Linen Duvet sets. The stitching is perfect. I recommend if you have a steam cycle on your dryer to run it through that prior to putting it on your bed. It removes the package lines easily as opposed to ironing them out. Found it! Soft, oversized, wonderful weave, it moves like a dress cut on the bias, and with just the right heft. It does not weigh down my precious down comforter within. I have always had an all white bed, but I got the pink because of a lovely image evoked by a buyer who reviewed here. Thank you, fellow purchaser for your effort, it helped me decide and I am so very pleased with it. 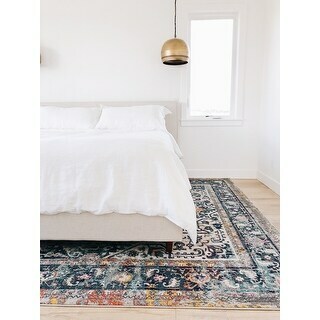 Overstock has become my favorite homeware store (I get absolutely nothing for making this statement except the satisfaction of relaying my genuine experience) and the place I have gone for fantastic bamboo shades, pillows, pillowcases, and this beautiful and elegant duvet cover that I love! Everything arrives precisely as promised and packed with care. I appreciate some items need much less packaging and I am so glad Overstock does not use more than is necessary. I spoke only once to a rep and they were courteous, clear, helpful. Every contact at every level has been a pleasant and satisfying experience. In contrast, I bought and returned a linen and cotton duvet cover from that was much more expensive, way too heavy, with closures that did not span the entire product. I appreciate Overstock for delivering quality and value at a much better price, and in a thoroughly professional manner, all the more when I do my (intended and unintended) research. Thank you! After I placed it on my guest bedroom, I couldn't be more pleased! I purchased the dark grey linen duvet set and it looks beautiful on the boxed frame. No headboard necessary! The shams are a great size and I set it off with a faux haired white pillow (also from Overstock). The ensemble looks fabulous! I looked forever for a linen duvet. This was the best price and great quality. I actually ordered a king size for my queen bed so I could have extra material drape over the sides and not need any type of bed skirt. I highly recommend. The color is spot on to what is pictured online. I am so happy with this purchase. I have been looking for a flax linen duvet that was similar to the , but without the super high price. This set is just beautiful. It has the linen texture I was looking for, but is very soft - especially for linen. I washed it immediately and tumble dried low..........came out very nice. The white is crisp bright white. Has that wrinkled look, casual, loft like, inviting. Can't say enough good things about this set. I’m really torn about this duvet set. If the colors in the stock photos were accurate this would be a 5 star review. But as it is, the color is REALLY pink which is not what I wanted. The duvet is of good quality and the price is excellent for 100% linen. The Brooklyn Loom duvet set is very light and airy. I love how it feels. It does give off a wrinkled casual look but you can iron it on a light setting if you prefer. I like it just the way it is. Best bang for the buck. Very nice linen. Not cheap. Looks great. Color was exactly what I was looking for. Was planning on buying duvet from high end online brand but this is as good at a very reasonable price. Definitely would recommend. I love this duvet! It has a lovely drape and almost a sheen to the fabric (not at all shiny but has a nice quality about it).The weight is perfect for my needs but the material is thin...almost sheer. I actually really like the light fabric. Color is true to the photo. It washed up well and I believe it will soften with more washes. Good price! So far - really impressed. I am waiting for my luxe comforter to be placed inside but so far so good. The linen defiantly brings a softer touch than my original bedding. Our second set! Love these sheets - they really soften with each wash and are great in the warm months. Yes they are wrinkled - but such is linen! Color (pink) not as shown. I returned it. Love this Duvet set. I bought the white and it’s incredible. It washes up well and is so versatile. The price it the best part. I haven’t found a better one out there. "Is this duvet soft or does it have a course feel?" It's not as coarse as most linens. It is soft, however it is still 100% linen so it still has a more raw texture. Because I prefer linen to cotton. It looks like what I have been looking for and much cheaper than the pottery barn price. "Does the duvet have ties in the corner to secure comforter?" The duvet does not have ties.